I have experienced some considerable difficulties with LGB 1600 and 1200 turnouts which I believe are generic to their design. This page describes what I have done to fix these difficulties. I found that the pivot screws under the point rails on 1600 series turnouts to be loose on almost every turnout that I had. Of course, I discovered this after the screws fell out and I had to pull the turnouts to recover and reinstall the screws. There is an easy fix. Before you install a turnout, Loctite the screw in place. There are many flavors of Loctite. Only type 222 is especially rated for set screws and it is the ONLY kind that should be used. All of the other types emphasize the "tite" part and if you use them, you'll never get the screw back out if you should ever need to. 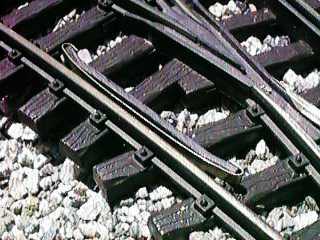 I found that derailments were common with these turnouts when pushing a cut facing point through the curved path of the turnout. The problem is that the curved point rail is gauged way too wide. When a car is pushed, its wheels tend to move to the outside rail (the point rail in this case). When the other wheel, the one on the stock rail, gets to the guard rail, it hits the guard rail. This is supposed to kick the wheel back in place and sometimes it does. However after the soft plastic guard rail gets whacked by a couple of hundred wheel flanges, it gets all dinged up as shown in the photo. The wheel then hangs up on the shredded plastic and cannot slide on the guard rail. Instead, it pops over the guard rail and a derailment occurs. Several attempts at refacing the guard rail proved fruitless. The only course of action was to fix the problem at its source. The turnouts need regauging so that the wheel on the stock rail actually slips inside the guard rail without actually touching it. Since moving the point rail looked like it would be very difficult, I instead elected to widen the inside edge of the rail to narrow the gauge. I did this by soldering a 1/32" thick piece of 1/8" to 3/32" wide brass strip stock to the inside of the point rail. This turned out to be actually pretty easy. My Track Soldering Tips Page has instructions you can use to solder the strips. You only need to solder the strips in a couple of spots each. If you look near the frog in the photo above you'll see the added strip. It is trimmed and bent so that if fits right into the frog assembly. 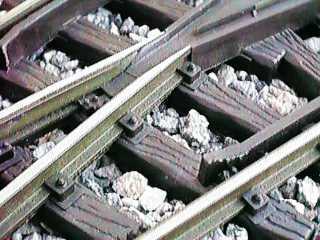 The strip extends down the length of the point rail to the gap between the fixed and moving parts of the point rail. From there another piece extends down to the point. The point end is trimmed and filed to allow unimpeded wheel passage. I've cut mine about 1/2" short of the existing point and I run a wheelset through the point by hand while twisting and pressing every which way to make sure that the wheel will pass without even feeling the new piece of brass. If the wheel catches anything at all, the point has to be worked over with a grinding tool or file until the wheel can slide through the point like it was a piece of straight (or curved) rail. The gap in the point rail needs to be checked the same way. Since I've installed this modification on almost every one of my turnouts, derailments are rare. Even without this modification, almost every LGB turnout needs point work. The point should be worked over with a small file or motor tool grinding wheel so that a wheelset can be pushed through the point without even feeling it. If you have metal wheels and you hear clicks when your cars are going through turnouts, the turnouts need work. Any wheel noise should be subdued. If not, it indicates that a flange is striking something or a wheel is lifting off the rail and dropping back down. Plastic wheels tend to deaden noise and you may not hear problems as well. Listen very carefully as you drag AND push a train through each and every turnout in both directions and with the turnout set each way. Any unusual click should be investigated and eliminated. There will be soft clicks as the wheels go through the frog even on a perfect turnout, problems are indicated by louder clicks or clicks caused by wheels at the points or the point rail gap. Listen carefully and you'll soon be able to tell the difference. 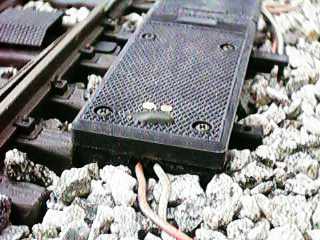 I have had less difficulty with LGB 1200 series (tight radius) turnouts, but I still had derailment problems on some turnouts. In this case, the gauge on the curved section is too tight on some but not all units. I believe that this is due to the way that the point rail was bent during manufacture. The impact of the problem is different, but the result is the same, derailments. When the gauge is too tight, a wheel tends to slip across the frog within the gap then hits the point of the frog straight on and pops over the frog. It appeared that just grinding on the frog would probably make the problem worse, so the solution had to be at the other wheel. 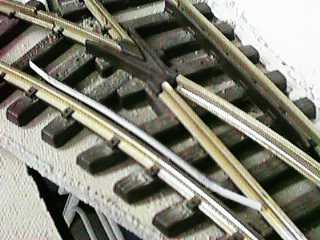 The gap between the guard rail and the stock rail is too large which allows the wheel at the frog to drift into the frog. I glue a 20 to 30 mil styrene or brass strip inside the guard rail to tighten up the spacing. This pulls the wheel on the stock rail over tighter against the stock rail and tends to allow the other wheel to barely slip past the frog. This solution has been effective as long as the added strip stays attached to the guard rail. As discussed below in The Impact of Adhesives on Tie Strips, few adhesives stick well to LGB tie strips. This modification is not necessary on every turnout, and on some you may have to tweak the strip thickness. 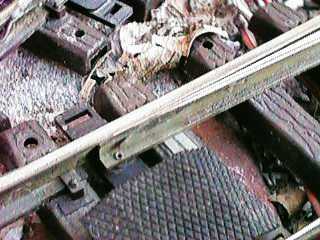 If you use too thick a strip, an underguage wheelset will bind between the guard rails on the stock rail and the frog which will cause derailments just as bad as having too thin a strip. I have had some difficulties LGB 1200 turnouts and the San-Val Little Wheelie Worker track cleaner attachment. The disks will hang up on the end of the point rails when moving trailing point. The solution is to break the corner at the end of the point rail with a fine file to allow the disks to slip over the end of the point rail. The point rails of both the LGB 1200 and 1600 series turnouts are electrically connected to their associated stock rail by three methods providing triple redundancy. However, when the turnouts are used outside, this is still not good enough to provide 100% reliability. 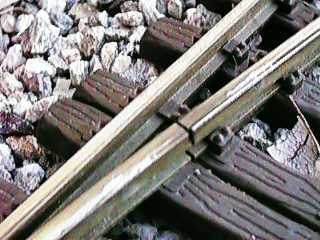 The point rails rest against a stock rail (sometimes), they ride on a metal slider strip (unless the strip gets cruddy which it does) and they pivot on a screw that has a contact wiper under its head. I still have troubles with a point rail going dead sometimes. The easiest and quickest remedy is to grab the point rail and move it back and forth while somewhat forcefully pressing it down onto the contact strip near the point to scrape off the crud that collects on the contact strip. This works in the short term, but it does wear the contract strip faster and it will eventually wear out. On one turnout, I've had so much trouble that I've soldered a small flexible wire jumper between the point rail and its stock rail. If a black wire is used, it can be hidden well enough so that it won't be seen unless someone looks for it. LGB turnout motors have no brushes and only two moving parts so they are usually pretty reliable. However, when they fill with water, they get pretty cruddy inside. The cover is designed to exclude water from entry from above and most of the time that works. However, sometimes a motor will leak through the screw holes for the wire terminals. This leakage can be prevented simply by leaving a bead of hot glue on top of the motor. If access is needed to the screws, the hot glue plug can be simply peeled off. If your motors are installed in areas where water rises above the openings in the side of the housings and floods the interior, you might want to consider drilling a drain hole in the bottom of the housing. This will let water in sooner, but it will let it out much quicker as well. Sometimes a turnout motor will stall before it completes its transition. If a motor stalls, it'll usually complain by buzzing. If the motor buzzes while it moves, its on the edge of a stall. It should snap to its new position very abruptly. There are several common causes of motor stalling. Too much mechanical load. If you use an LGB 1203 accessory contact or a lantern, the mechanical load on the motor may be too high. Try more voltage (next bullet). Insufficient electrical power. If you run your motors from the typical 16 VAC output from most power packs, there is barely enough power to operate a turnout motor under ideal conditions. Under adverse conditions it isn't enough. Find a source of 24 to 26 VAC. If you throw more than a couple of turnouts at once, you might need more than a 2 amp source. Radio Shack sells a 25 VAC transformer that works fine. High wiring resistance. Check your wiring, you might have excessive voltage drop due to too much wire, too small wire or a bad connection someplace. If the voltage at the motor is more than a couple of volts less than the voltage at the control switch, look to your wiring. Ballast stuck in the points or throwbar. Pick out any interfering foreign objects. Corrosion on the metal sliders. The metal strips that the points slide on get cruddy and add drag. Manually move the points back and forth several times while pressing down on the point to scrape this crud off. Crud in the motor throwbar. Take the cover off and pull out the throwbar. Use a small brush to clean out the channel where the throwbar slides. This area often gets clogged with dirt and adds considerable drag. Lubricating the throwbar is not necessary, just make sure that it is clean. Armature not centered. If a motor usually throws one way but not the other the motor may need centering. The motor armature only rotates a half turn. However, the throwbar travel will limit the armature rotation to less than that. The motor generates maximum torque at the center of it's rotation, so the throwbar should be halfway through its travel at the center of the armature rotation to achieve maximum throwbar force. If you haven't paid attention to the position of the armature when you reassembled the motor the last time, odds are it is not in it's optimum position because the motor tends to roll to one side or the other. Pull out the throwbar and manually rotate the armature to roughly the center of it's travel. It will barely stay in this position by itself. Then move the points to half travel and reinstall the throwbar so that it is centered in it's travel range. If there is a 1203 accessory switch attached pull it off. Remove 4 screw that retain the cover and remove the cover. Gently pull up on the metal field piece, the whole motor assembly will rotate upwards around the wires that connect to the motor. There is no need to remove the wires themselves. Two plastic pieces will fall off the sides, wipe them off and set them aside. Clean and dry the inside of the housing and the cover. Brush, blow or pick out all the grit and debris that have collected inside. Pull the armature out of the motor. It consists of a bar magnet and two plastic caps. The magnet is marked red on one side. Note the position of the red side with respect to the small tab stop sticking out right next to the geared end. Look inside the metal pole pieces and use a small brush to remove any debris that is inside the pole pieces. If they are badly corroded, use a small file to scrape the corrosion off and brush it out. If the magnet separated from its plastic holders when you pulled it out, put it back in the same orientation with respect to when it was pulled out. Not to worry if you get it in backwards, the motor will just run backwards so you can either reverse the wires or take it back apart and reverse the magnet. Reinsert the armature assembly. The small tab next to the gear should be on top. Place the two plastic rotation stops in the slots between the pole pieces. The longer tab goes nearest the gear. Gently rotate the motor assembly back into the case and press it down. Manually rotate the gear until the tab is centered at the top, it should stay that way. Move the turnout points to the halfway point of their travel. Place the throwbar in the center of its travel. When you move it back and forth, the tab on the gear should rotate about 45 degrees either way from the top. Reinstall the cover and the 4 screws. If necessary, reinstall the 1203 accessory switch and retest. Note the ( ) in the designation. This means that that position is momentary. The switch is spring loaded and will return to the center position when the handle is released. While trying to reface and shim the guard rails, I discovered that almost nothing will stick to the tie strips used on both LGB and Aristo turnouts and track. Solvent type cements, CA (super glue), epoxy and the stuff that comes with plastic building kits don't work at all. Regular contact cement works marginally well. GOOP brand silicone adhesives work a little better than contact cement, but still produce only a marginal bond. Bob Poli writes: "I have also found that closing the space between the guard rail and active rail helps to keep the flange out of the frog. The only success I've had with bonding is to first drill small holes in the plastic rail then bond either brass or styrene strips, I prefer brass, to the side of the plastic rail. I use 5 minute epoxy. The real bond is created by the mechanical bond of the epoxy flowing through the holes and out the other side of the rail. It's best to coat the surface of the plastic rail first and make sure the epoxy goes through the holes. Then apply the brass strip which is preformed to the curve. Try and get some epoxy to encapsulate the brass as much as possible also rough up the brass with some emery paper to help the epoxy to stick. This should last indefinitely and it does help keep flanges between the rails." Todd Brody found that he could reface a damaged plastic guard rail by bending a 1/64" thick by 3/32" wide brass strip around it as shown in the photo. He found specific instances where this improved tracking. I've tried it also and it hasn't worked so well for me. This does get rid of the glue problem however, and the piece is removable and replaceable. Note that brass strip is usually die cut such that the edges on one side are rounded and the edges on the other side are sharper. The rounded edge should be the one facing the wheels. If you've found another method that works, I'd like to hear about it.